Choose this strong 2 ply leather collar with brass buckle. Sizes: 17-40 in (43-100 cm). Colors: black and brown. Dogue De Bordeaux dog breed is a strong and big dog. To control Dogue De Bordeaux temperament you will need a strong thick dog collars. 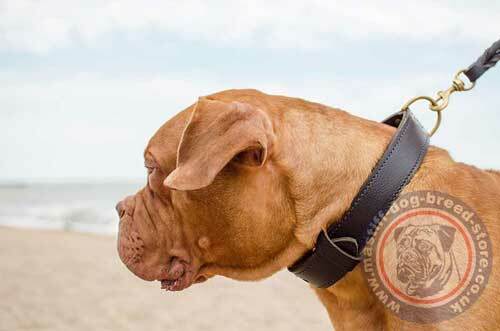 We propose handmade, 2 ply leather collars for large dogs, that will help you to manage Dogue De Bordeaux temperament. These 2 ply thick dog collars are reliably stitched and equipped with strong, luxury brass hardware. The classic buckle is strong and reliable. Dog's neck is protected from buckle with a square padding. 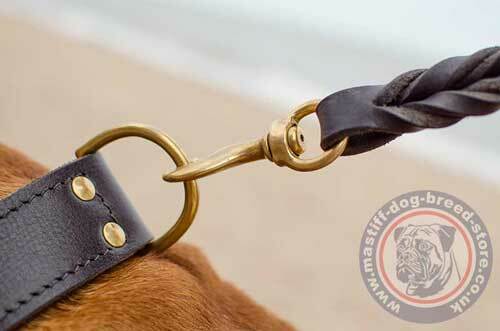 Thick dog collars have cast D ring for lead and tag adjusting. The D ring is reliably stitched and additionally riveted. The super strong design of these Dogue De Bordeaux collars are intended for dog walking, training, sport and service dogs. Choose neck size from the options at the top and we will make a dog collar fitting on a central hole (С at the scheme). Each dog collar with buckle has 5 holes on the distance of 1 inch (25 mm) between each two holes. 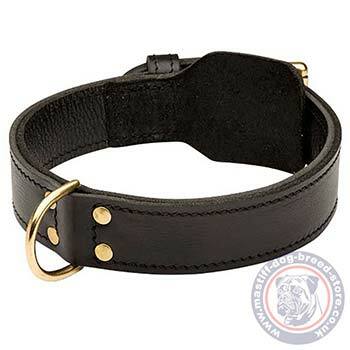 Example: if a dog neck size is 20 inches (50 cm), a collar will have size 20 in (50 cm) on the central hole. These dog collars are handcrafted and some sizes will differ a little (not in significant way). But you will always have the chance to adjust it maximum fit for your dog. 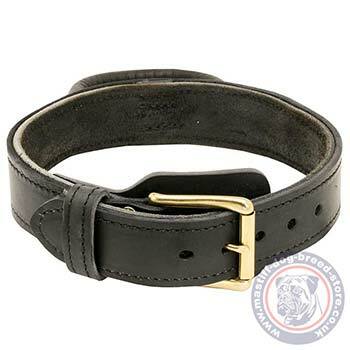 2 ply leather collar will correspond to dog's neck at the 2-3rd hole in folded position. Thus, in stretched position it will correspond dog's neck at 1st-2nd hole because of its thickness. See more leather dog collars and matching leather leashes for your dog.